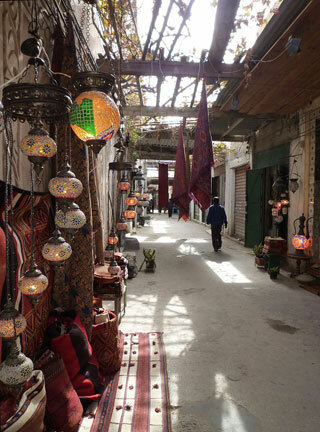 Tripoli's old town, the Medina, is still unspoiled by mass-tourism, though it was increasingly exposed to more and more visitors from abroad, following the lifting of the UN embargo in 2003. However, the walled Medina retains much of its serene old-world ambiance. The Red Castle Museum (Assaraya al-Hamra), a vast palace complex with numerous courtyards, dominates the city skyline and is located on the outskirts of the Medina. There are some classical statues and fountains from the Ottoman period scattered around the castle. An Ottoman saray now houses the Traveler's Library. This article uses material from the Wikipedia article "Tripoli Medina Quarter", which is released under the Creative Commons Attribution-Share-Alike 3.0 License.